MARINO, THE MISTER OF RECORDS! And 'the only coach who, in the history of women's football, led a cadet team to play for the final of the Italian Cup, lost only in extra time. 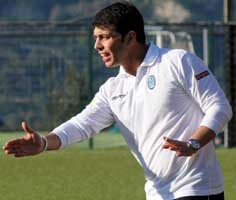 His arrival in women's football dates back to last season where he won a nice second place behind the Riviera di Romagna and then continue this season with the victory of his group and its promotion in Serie A, accompanied by a prestigious record: 17 months of Unbeaten, national record of all the main team sports, male and female, lost, the 2 June, in the extra time of the Italian Cup final played against Brescia. 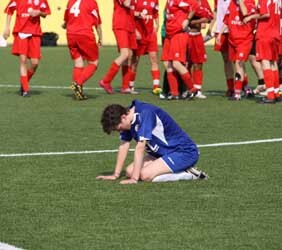 Final ended with the result of 2 2 to the triple whistle of ninety minutes. If football is a questionable sport, these are irrefutable data that highlight the curriculum of a coach prepared and scrupulous, but it was not enough for the Neapolitan technician to win the AIAC Silver bench or the best mister prize at the Golden Girls 2012, regarding the A2 series category. A necessary note for a coach who has reached important milestones, starting point to face with awareness the next experience in the Serie A championship. SienA ... Flame ... what a pity ...! Siena wins between the exultation of the bianconere players and the disappointment, bitterness and a few tears of the girls of the Flame. This is the law of sport, which does not admit replies, but which can give rise to (and we would lack ..) points of view as varied as possible and recriminations for what could and has not been. It was a game played by two teams with two diametrically opposed conceptions of game: Siena with the old form called "all'italiana", a strong defense, long raises from three quarters that exceed the midfield prey of two fast strikers like Fambrini and Migliorini; the Flame that makes the "collective" his creed, which plays the ball in every area of ​​the field and that has different solutions in attack or through the side bands (Cambiaghi and Gaburro) or in the central streets with the inclusion of midfielder (Re , Nencioni ..). Read more: SienA ... Flame ... what a pity ...! The dream of Res Roma to reach the final of the playoffs valid for the promotion in Serie A vanishes at the twenty-second penalty: the goal from the Tuscan goalkeeper Mazzola decree in fact the victory of the bianconere after a match fought and always poised, where the yellow-red were not able to materialize the large amount of game produced during the ninety minutes and thirty extra time. Mister Melillo opts for the usual 4-3-3 with Pipitone between the posts, Lavopa, Colini, Mancini and Cortelli in defense, Villani, Fracassi and Sergi in midfield, and with the attacking trident formed by Nicosia, Biasotto and captain Nagni . A FLAME "in GREAT SPOLVERO" wins the FINAL! "I have to congratulate the girls, their professional maturity, their commitment during this week of work and how they have followed me throughout this season": these are the first words of Mister Antonio Cincotta (elected best coach of Group A at the Golden Girl) after the beautiful victory of his Fiammamonza against South Tyrol in the first play-off match to go into the Serie A. In front of over 400 spectators, the two teams, who arrived second respectively in group A and B of the A2 series, gave birth to a good match, played, despite a hot heat, at a good pace from the first to the last minute which won the team best organized in each department and that has fielded a collective game that rarely can be admired on the football fields of this category. Read more: A FLAME "in GRANDE SPOLVERO" wins the FINAL! The adventure is over, but there are still great applause for a team capable of competing in a year of great, great value and that perhaps deserved a better fate. The promotion dream in Serie A long cherished by the CFS during the season ends in the playoffs. On the neutral field of Verona, the red and white were indeed defeated by 3-1 from the noble and quoted Fiammamonza, who thus deservedly access the decisive play-off against Siena (victorious for 8-7 on penalties on Res Roma). A dry match that will allow the winning team to access the last match valid for the promotion in Serie A. The bianconere believe it, as well as the fans and the club. It was a very difficult year, without a field to train and where to play at home. A situation that has created considerable inconvenience with the women's teams of Siena forced to move throughout the province to train and play games. With four games left at the end of the season, Mister Montanelli leaves the bench. It could have been a bad blow but the Sienese proved to be a compact group, united and with lots of willpower. Captain Fambrini took over the team and with the technical help of Mister Migliorini the Bianconeri have returned to winning and now they really deserve a place in the major series. Or inside or outside: for the CF SÜDTIROL the hour of the first verdict has arrived !! So we are almost arrived at the 3 June, the date when the PLAY OFF game will be played for the promotion in Serie A against the second of Group A A2 Series, the Fiammamonza. 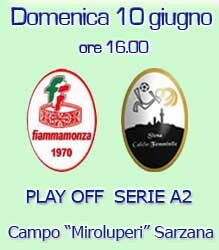 The game will be played just Sunday 3 June at 15,30 in Verona. FIAMMAMONZA - CF SÜDTIROL will be played at the Stadio "Olivieri" in Verona located in Via Sogare - Zona Impianti Sportivi (artificial turf field). The winner will then play, Sunday 10 June, against the winner between SIENA CF - RES ROMA. 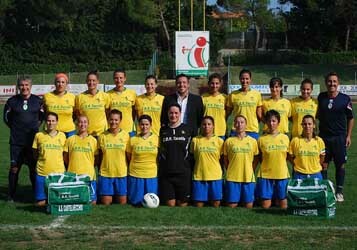 One therefore among these four teams will go in SERIE A, the maximum olympus of the national female football. Match therefore in neutral field, in case of a tie you will go to extra time and then eventually to penalties. Read more: In or out: for the CF SÜDTIROL the time for the first verdict has arrived !! Worse could not finish. Not even the great Hitchcock, master of the chill, could have written such a macabre ending. Two games of play out between the walls of friends against two teams already beaten at home in the regular season, two out of three results available, both badly lost with the slightest gap but with so much bad luck even if we have something of our own. Also yesterday we hit an incredible crossbar, had a couple of important occasions that failed spectacularly but also yesterday we suffered two goals on two indecisions of our rearguard that make the pair with the two signatures of which we have honored the opponents of the first round seven days ago! Finally Play Out, on the Municipal of Savignano sul Rubicone challenge and descend on the pitch, for the most important race of the season, the Castelvecchio and Vicenza in front of about 1000 spectators, never before seen in Savignano for a football competition Female. Race playoff for the stay in A2 where, the landlords get us a strong position in the standings and then with the ability to play this game between the walls of friends and save even with a draw.